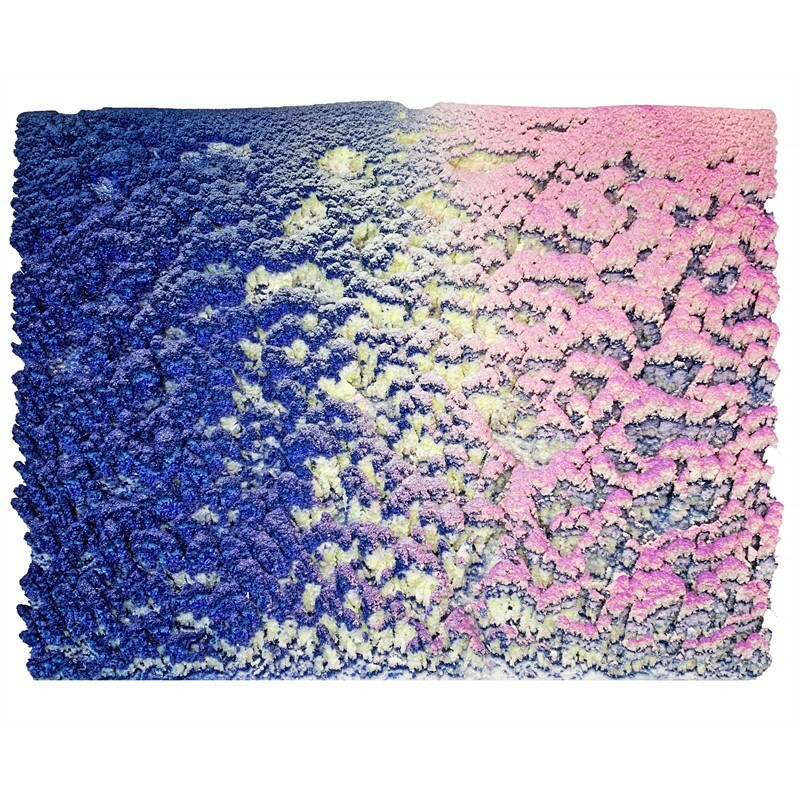 Dylan Gebbia-Richards, a young artist whose pioneering technique reveals an ambitious and fruitful effort to transform the conceptualization of works in encaustic.These sculptural installations result in surreal landscapes that compare to a hyper realistic, microscopic version of the natural world. Creating a ubiquitous body of work by augmenting our perception, Gebbia-Richards’ works’ envelops its audience as they find themselves engaged within a new and dynamic sensory network. At 25, Gebbia-Richards has developed a signature style that is distinct and identifiable, and yet is open to further growth and exploration. His talent has been widely recognized and he has already procured curatorial attention. Gebbia-Richards technique in isolating drips and splatters of wax, pigments, and other colors allow elements of playfulness and exploration to seep through into the installations. He creates his work within his own microclimate; his studio provides the perfect setting where he is able to conjure up the perfect conditions to allow the art to become a product of its own making. As an artist, he interferes minimally permitting the moment and variables to interact with each other with full autonomy. The crystalline structure of his work is founded in fractal geometry in order to best emulate the patterns of the natural world. 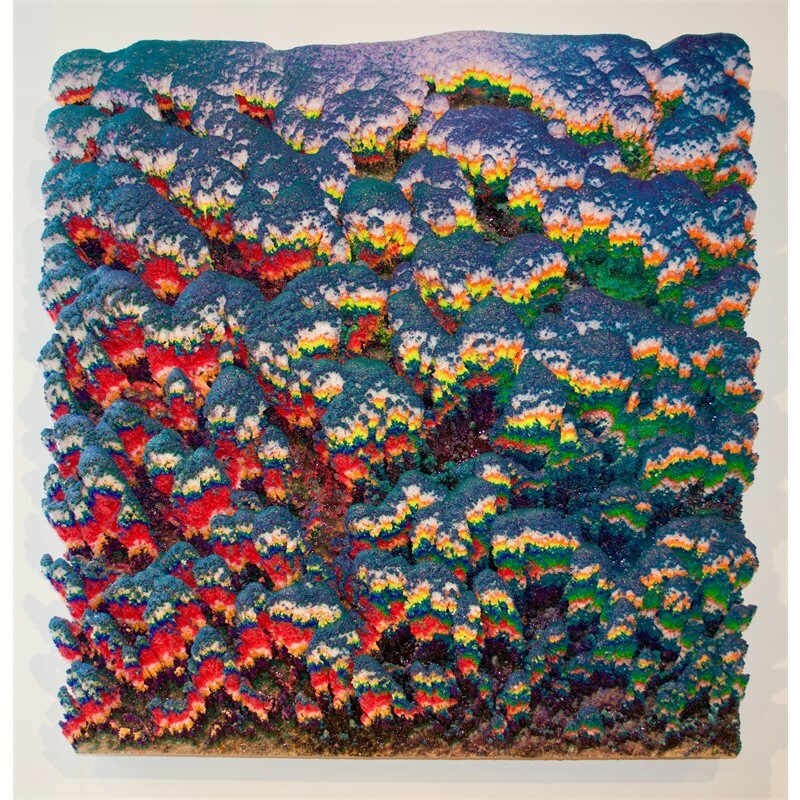 Dylan’s pieces perform an intimate encounter with immersive landscapes that simulate the complexity of coral reefs or an aerial forest with a psychedelic color palette. “I see my works as their own landscapes, I allow chance, the driving force behind all natural phenomena, to sculpt the structures of my paintings.” -Dylan Gebbia-Richards Dylan Gebbia-Richards, a young artist whose pioneering technique reveals an ambitious and fruitful effort to transform the conceptualization of works in encaustic.These sculptural installations result in surreal landscapes that compare to a hyper realistic, microscopic version of the natural world. Creating a ubiquitous body of work by augmenting our perception, Gebbia-Richards’ works’ envelops its audience as they find themselves engaged within a new and dynamic sensory network. At 25, Gebbia-Richards has developed a signature style that is distinct and identifiable, and yet is open to further growth and exploration. His talent has been widely recognized and he has already procured curatorial attention. 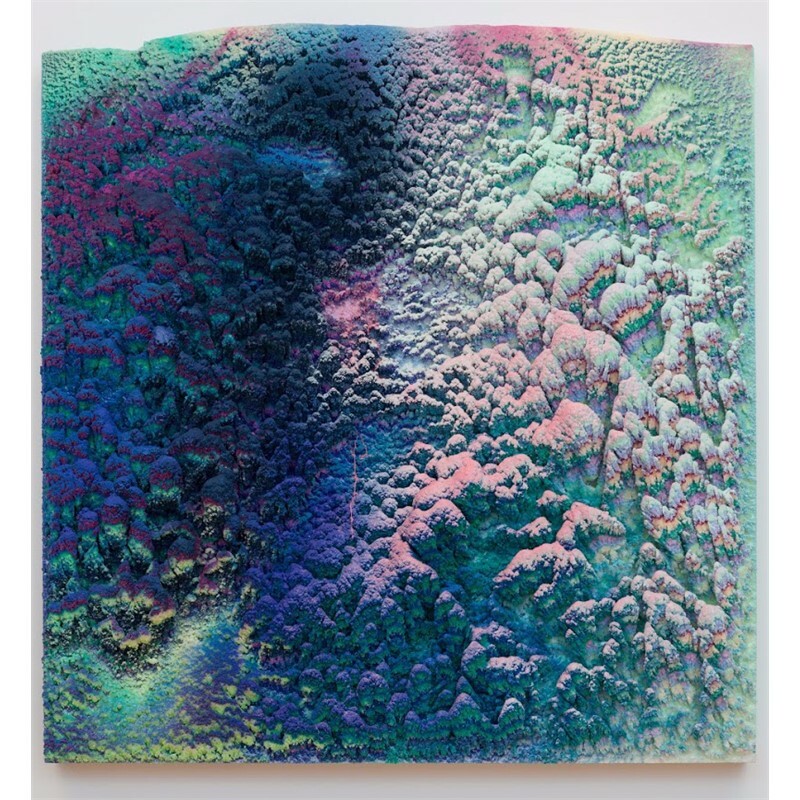 Gebbia-Richards technique in isolating drips and splatters of wax, pigments, and other colors allow elements of playfulness and exploration to seep through into the installations. He creates his work within his own microclimate; his studio provides the perfect setting where he is able to conjure up the perfect conditions to allow the art to become a product of its own making. As an artist, he interferes minimally permitting the moment and variables to interact with each other with full autonomy. The crystalline structure of his work is founded in fractal geometry in order to best emulate the patterns of the natural world. 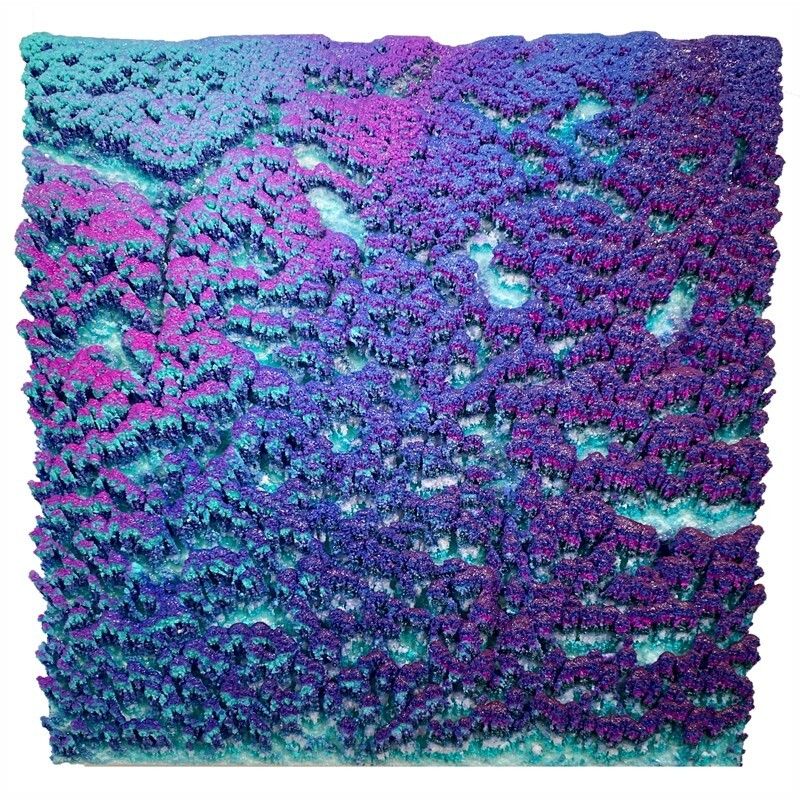 Dylan’s pieces perform an intimate encounter with immersive landscapes that simulate the complexity of coral reefs or an aerial forest with a psychedelic color palette.